One of the most important decisions your company will make is to choose the right spokesperson for your brand/company. Many people make the assumption that it should always be the CEO. While that may be true some of the time, during a crisis think twice about using your CEO in that capacity. Myth 1: The CEO is the only person who should speak for the company. The CEO should definitely be visible and even make statements, but in a major crisis it is best to appoint a separate spokesperson. 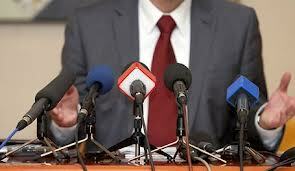 Spokesperson duties removes the CEO from his work and can be a waste of their valuable time. A crisis situation requires an individual who has the right personality and is trained to handle the stress for this type of position. For Example: CEO Tony Hayward (ex-CEO now) during the BP crisis. Tony made many statements that were unfathomable to the public and the people injured by the oil spill. He was the bitt of jokes on every network and he brought the value of his company down even further by giving unrealistic comments. Myth 2: There should be only one spokesperson. Each company should have “one voice” for your company or brand. Though, you can have that one voice come from different people. As long as your message is consistent, you can have a couple of spokespersons – especially if there are technical or operational areas to be discussed. You can use experts from each area to explain their fields and have a main spokesperson to give statements. Myth 3: Legal counsel should decide what is said. While it is important to know what the lawyers tell you is legal and not, etc. you need to follow what is best for the company and its publics. An organization can win in a court of law, yet still lose in the court of public opinion. Myth 4: The CEO must be ‘on the spot’ to take charge. CEO Tony Hayward was inundated with work as the spokesperson for BP. The crisis was extremely large and Hayward became quite irritable. Listed below are a few of Tony’s quotes and a couple of late night jokes that came out at the same time. “There’s no one who wants this over more than I do. I would like my life back.” BP CEO Tony Hayward, May 31, 2010. “When do we ask the Sierra Club to pick up the tab for this leak?” –Blaming the oil spill in the Gulf on the Sierra Club, arguing that the environmental group had driven oil producers off the land to more high-risk situations offshore, May 17, 2010. “I think the environmental impact of this disaster is likely to have been very, very modest.” —Tony Hayward, interview with Sky News television, May 18, 2010. “What the hell did we do to deserve this?” –BP CEO Tony Hayward, speaking to fellow executives in London about the Gulf oil spill disaster, May 2, 2010. “The Gulf of Mexico is a very big ocean. The amount of volume of oil and dispersant we are putting into it is tiny in relation to the total water volume.” —Tony Hayward, May 14, 2010. “Yeah, of course I am” —Tony Hayward, when asked if he sleeps at night, Forbes, May 18, 2010. In the end Hayward lowered the value of BP by billions of dollars and lost his job. If you were CEO of BP – what would you have done after the oil spill in the gulf? How would you have handled their PR? Do you believe that a CEO should ALWAYS be the crisis spokesperson?